Twitter100 is one cool web service that allows you to view recent updates from 100 Twitter Friends on a single page. With this you can follow latest postings from 100 Twitter Friends in one glance. After opening the website, just enter your Twitter username and hit ‘100’ button. You will see the latest enteries of your respective Twitter Friends. You can configure webpage to refresh after 3mins, 10minsm 30 mins. 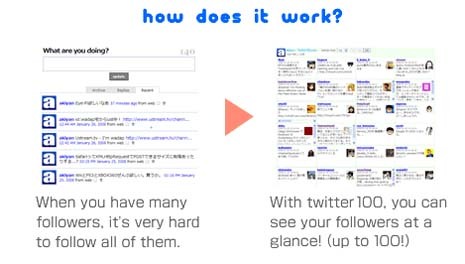 With this you can view updated recent posting from your Twitter friends automatically. Twitter100 – Click here to follow 100 Twitter Friends in one go!